When I'm out and about, I hear people talk about eating. Unfortunately, the talk isn't usually about polenta, pepper-crusted salmon, and baked apples; it's scientific words like omega 3, antioxidants, and cholesterol. My new least favorite term? Glycemic index, a phrase that always gets hooked up with poor simple potatoes. People equate lovely pommes de terre with white flour. Folks, they are not the same. Potatoes are getting an unfair rap. Carbohydrates that break down rapidly during digestion score highest on the glycemic-index scale. Carbohydrates that break down slowly, releasing glucose gradually into the bloodstream, have a low glycemic index. A lower glycemic index suggests slower rates of digestion and absorption of the sugars and starches in the foods. A lower glycemic response is often thought to equate to a lower insulin demand, better blood-glucose control, and a reduction in blood lipids. 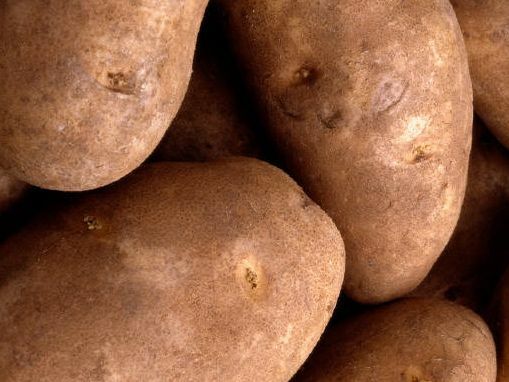 Because potatoes are a rapidly digesting food, they've been labeled "high glycemic index." The presence of other foods eaten at the same time, however, changes the overall glycemic index of a meal. If you have some butter with your potatoes or a piece of roasted chicken, the glycemic response lowers considerably. We usually don’t eat foods in isolation, which makes the concept of the glycemic index less useful than the media would have us believe. The big picture of blood-sugar issues is fairly straightforward. As a nation, we have allowed our waistlines to swell and our delicate blood-sugar mechanism to be overworked with our everyday diet. Americans consume 149 pounds of sugar per person every year. Folded into that figure is 53 gallons of soft drinks guzzled by each American every year. With our soda, we are downing burgers on refined-flour buns, pizza made with white flour, chips, cookies, and frosted flakes. This is certainly the path to an obesity-and-diabetes epidemic. Sugar and white flour not only raise blood sugar rapidly, they have no nutrients or fiber to accompany them. They are just empty calories — calories from foods that can’t be found in nature, but must be manufactured. I just can’t see why mashed potatoes have been thrown into the enemy camp with them. Humans require a certain amount of carbohydrate foods each day to meet energy requirements. The body prefers carbohydrates for energy. So that we don’t overeat, it's a good idea to choose carbohydrates that come from whole foods; the fiber present in most whole foods makes us feel fuller on fewer calories. Brown rice, quinoa, kasha, and wild rice are grains that are whole foods. Squash and potatoes are starchy vegetables that are whole foods. They are also good choices for fulfilling carbohydrate needs. Squash or potatoes served as a soup or side dish with a big green salad and pan-seared fish is my idea of a happy meal. If we focused on real whole foods each day, maybe we could begin to relax and enjoy our meals. Instead of talk about how to manipulate nutrients to control physiology, maybe that talk could be about the potatoes you grew last summer that you're still digging up in your garden. And how good they taste roasted with rosemary.